OIL bagged the national ‘Golden Peacock Award for Corporate Social Responsibility’ 2018. 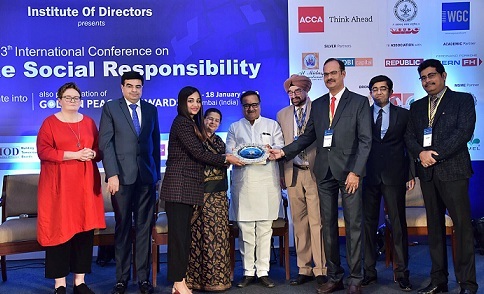 The award was conferred to Oil India Limited (OIL) at the 13th International Conference on Corporate Social Responsibility and Golden Peacock Awards Presentation Ceremony at Bandra (West) in Mumbai recently. The award was presented by Prakash Manchubhai Mehta, Maharashtra minister for housing. On behalf of OIL, the award was received by SK Chakravarty, general manager (CSR), Tridiv Hazarika, general manager (CSR & CC) and Nayana Madhu Dutta, manager, CSR. Oil India Limited (OIL) is the second largest hydrocarbon exploration and production Indian public sector company with its operational headquarters in Assam’s Duliajan. OIL is a state-owned Navratna under the administrative control of India’s ministry of petroleum and natural gas with its corporate offices in Noida in New Delhi-NCR region. The company is engaged in the business of exploration, development and production of crude oil and natural gas, transportation of crude oil and production of liquid petroleum gas. Its history spans the discovery of crude oil in the far east of India at Assam’s Digboi in 1889 to its present status as a fully integrated upstream petroleum company. The award is recognition of OIL’s commitment towards socio-economic development of the people residing in OIL’s operational areas empowering them to script a better tomorrow. Fulfilling its duty as a responsible corporate citizen and in line with the Companies Act, 2013, OIL undertakes CSR programmes and projects under key thrust areas such as Education, Healthcare and Sanitation, Sustainable Livelihood Generation, Skill Development, Rural Sports, Augmentation of Rural Infrastructure, for improving the quality of life of the people and communities residing in its operational areas.